Welcome to my Trip Report on Scoot and the 787 Dreamliner! Photo is from my good friend, Raymond. For the past few years, March has been my month of travel, so 2015 would be no exception. I decided on South Korea because I had a couple of events to attend and this made my flying trip even more significant. Once that was decided, it was time to make the booking of both flights and accommodation. Low airfares come and go, so I booked my air tickets pretty early this time, about 2 months before day of departure. Flying to my destination solo gives me the freedom to choose how to get there; first route that came into mind - SIN-HKG-ICN instead of flying direct. Choosing which airline and aircraft type is what I enjoy most. That is provided the airfare matches my budget! SIN-HKG-SIN route with Scoot was a no-brainer, flying the airline for the Boeing 787-9 Dreamliner, as it would be a new subtype for me. After that, I was looking at Ethiopian because I was keen to fly the airline's Boeing 787-8 on HKG-ICN-HKG sectors, and at that time the airfare was around U.S $400 for on selected dates (3 times weekly). However, thanks to cheaptickets.sg, I found something better; a return trip with Asiana Airlines for U.S $370 included an A380 and Boeing 747-400 Combi ride. Not long after, I did the booking. Later on I did some changes to my itinerary and it was expensive changes. Since I didn't have a choice, I went ahead with it. I chose to depart on Sunday since the airfare on Saturday was ridiculously expensive. As a result I had less time to rest as I would be flying to Jeju the following day. The changes on both ways cost me $230 including seat assignment, adding on early check-in ($5) and 1 hour Wifi on the return sector. I will write a report on the WiFI on part 2. Trip report links will be posted in here once they are completed. 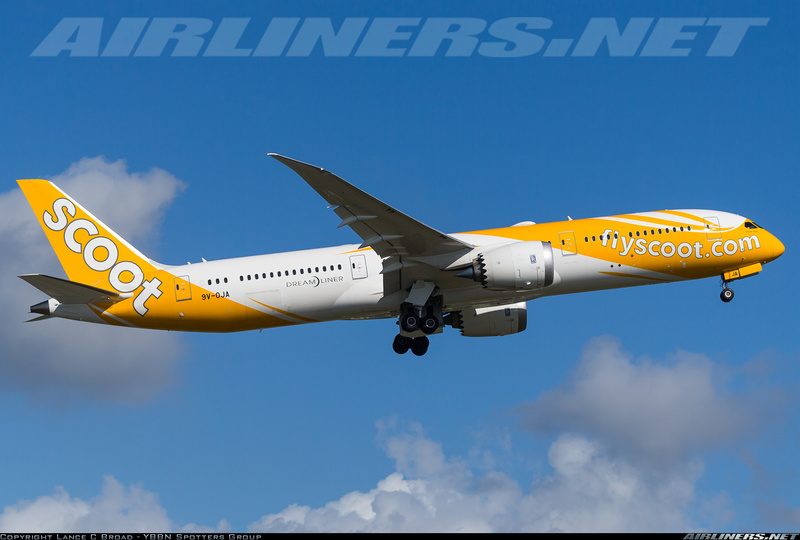 When Scoot announced the Boeing 787-9 schedule, HKG was one of the destinations that caught my eye. I could fly with this carrier and catch another to my desired destination. Travelling solo, I prefer flying the long way. Since I decided to fly to Seoul, the decision to fly with this airline to Hong Kong was an easy one. Later on, I decided to stay a couple of nights in Hong Kong to pay visit a couple of friends and I chose my favourite hotel, Ibis Northpoint once again for this trip but ended up at ChangKing Mansion in order to save money. I wouldn't recommend this place if you are with someone. Checking the schedule of the delivery dates of the airline's 787-9, by the time I fly on my departure date, the airline would be operating 2 Dreamliners; 9V-OJA and -OJB. The other destination that the Dreamliner be operating is Perth. 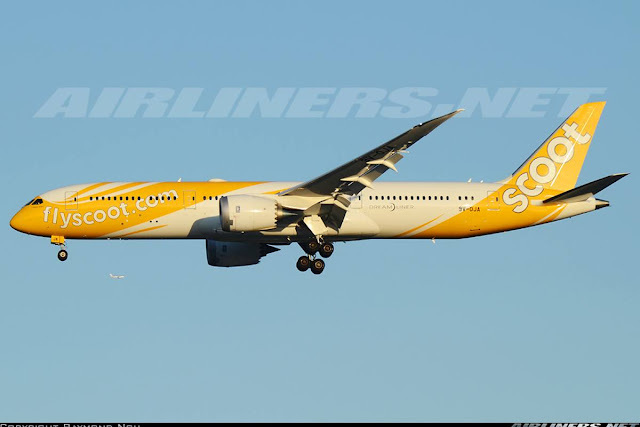 The reason why Scoot chose Perth and Hong Kong as launch cities for this new airliner is that there are spare parts in these two cities and matching flight timings. The delivery of the first aircraft was originally supposed to be scheduled in November 2014, but because of delays with the seats, the date was pushed back to February, so I was still safe. Any further delay, I would be looking at flying the Boeing 777 which I do not want. However, the good news was the airline's first 787-9 had entered service with the airline, with the 2nd joining the fleet soon. An improvement compared to the version this airline first used; its more user-friendly. Booking my tickets was an easy-affair and I was pleasantly surprised how smooth it went. 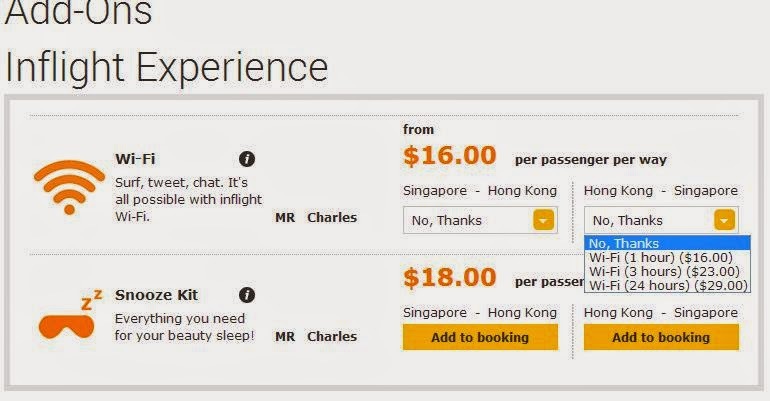 It has basically everything that a passengers need, even with features that other Low Cost Carriers don't have, such as lounge access and early check-in privileges for Y class passengers and of course you have to pay to use them. I find the lounge access useful and personally I will pay for it depending on the time of departure. Later on, because I had to change my flights, I chose 23K and 5A for my return. Even using the mobile phone, I was able to make changes without issues. I used the web version which I preferred. Do take note that the aircraft type is not listed on the website. How to know which aircraft you are flying on? For Economy class layout: 3-4-3 = Boeing 777-200ER and 3-3-3 = Boeing 787-9. For ScootBiz layout: 2-4-2 = Boeing 777-200ER and 2-3-2 = Boeing 787-9. Paying the extra fees is expected and I hope I won't have to go through this again. Once the payment was made, I received an email regarding the instruction on how to log on to it and password was given. I was wondering whether could I use this on any other flights. My updated booking. I decided to go for the normal seat instead of paying extra for the yellow seats. My return flight on ScootBiz. I tried using the mobile app to see whether I could make changes, but wasn't able to do so. I can only view my itinerary and that's about it. On the positive side, if you are a regular Scoot traveller, you can save your profile on the application, so that when you make your next booking, you won't have to repeat keying in your details. That's convenient. I decided to take advantage of the $5 early check-in so that I can avoid the crowd on the bus to the airport that evening. Another reason is I won't have to rush to the airport to join the long queue since this airline doesn't have online check-in. Looking at the Scoot's website, the timing for the early check-in was 12 pm to 9 pm for flights up till 3 am the following day, so my flight falls in this category right? When I went to the check-in counters, I went over to the help desk since there wasn't any early check-in counter and asked about it. He told me that early check-in was from 8.30 am onwards and since I was there around 8 am had to wait for another half an hour which didn't make sense to me. I showed both him and the lady staff about the early check-in from Scoot's website and they were puzzled as well. The male staff told me that that was wrong and for airport side, it was from 8.30am onwards, so who do we follow? Luckily, I got it done fast at 8.30 am and reached my work place on time. It was pretty busy in the morning as most passengers were heading to Qingdao, flying on the airline's Boeing 777. Singapore celebrates its 50th birthday in 2015! After that, off to work I went and 12 hours later, I was back at the airport. Time to fly again, this time on Scoot's newest aircraft - the Boeing 787-9 Dreamliner. The airline could make its boarding pass nicer though. At that time, the airline was operating 2 Boeing 787-9; 9V-OJA and -OJB. Doing some checking on both routes, 9V-OJA was scheduled to operate the HKG flight so that's great that I was going to fly on Singapore's first Boeing 787-9! Before dinner, I met up with a couple of good friends whom I haven't seen for a long time! We had a couple of hours of catching up before I made my way to Ramen Champion for dinner. I had a huge craving for this! It was one of the popular Ramen noodles from one of the stalls and it cost S$16, is it worth the value? I don't think so. I had mango pudding at a HK dessert place at the airside of Terminal 2. Time passed quickly and soon it was time to made my way to the furthest gate in the terminal. The bad thing about this gate is not able to take any decent shots of the aircraft, somehow I was a bit worried that the aircraft could change to the Boeing 777. Luckily, my flight was not cancelled if it is, it would affect my next flight with Asiana to Seoul Incheon later that day. Finally, I reached the gate! Since, it wasn't opened, I decided to walk around a while more. This caught my attention while entering the central part of airside. Once I went back to the gate, it was opened and the holding area started filling up with passengers and looking at the numbers, it looked like a full flight which I was not wrong, only 2 seats were vacant in Economy Class. The excitement of flying with the airline's brand new Boeing 787-9 grew as soon it was time to board the aircraft. I had previously flown with this airline before on the Boeing 777, you can check out the trip report over here. Boarding was on time, ScootBiz passengers got to board first before the rest of us were allowed to do so. A long queue for Economy class was formed, but not long after, everyone was on board. 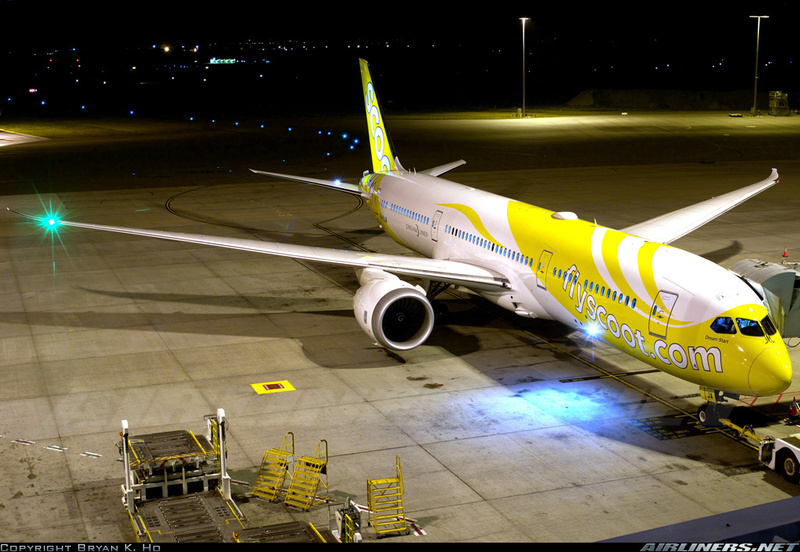 Welcome on board Scoot's newest flagship, the Boeing 787-9 Dreamliner! "Your seat is on the right hand side, row 23 window seat." Here are some photos! The most exciting part is entering the aircraft! For ScootBiz seats, please wait for my part 2. Seat looks very 'low Cost'; you normally find them on an A320 or B737, not on a Boeing 787. The seat is slightly uncomfortable for me and legroom space is average, so I recommend paying more for legroom space, its worth the $$ especially for longer flights. Waiting for other passengers to board. This was my seat, 25K. I originally chose the row near the rear but because I changed my flight to a later date, those rows near the rear were unavailable and had to settle for this one. The view from my seat, look quite awful without the IFE system. The airline decided to save weight and instead promote its WiFi to the public, it isn't cheap and more on that to come. Every seat has this head rest cover to promote its WiFi availability- a joint venture with T-Mobile. These seats including ScootBiz's don't have USB port, and if you want to use the AC adaptor, you have to pay $5 for it (ScootBiz is free) and the crew would turned it on for you. Thumbs down for this! The seat pitch; it wasn't too bad for me. I didn't have much issue especially with a couple sitting beside me. A Scoot girl was waiting to help other passengers. Some instructions for passengers to follow. Passengers like myself rested our hands on it and it often triggered the crew call button, but eventually we were careful with our elbows and there wasn't much accidental crew calls in the later part of the flight. I had to stare at this for the next 3 hours and so, fortunately I was sleepy and managed to grab a couple of hours of sleep. Can you count how many blue lights? This wasn't so bad. We were ready for departure! Let's see how powerful this aircraft is compared to the Boeing 787-8. It didn't disappoint. The lighting was changed a few times during the flight, its pleasant for our eyes and have to give Boeing designers for coming out such a pleasant cabin. During the flight, I walked around to snap some photos. It seems I was the only one interested in the aircraft as I got a few stares while walking through the cabin. Are you impressed with the cabin interior? I am certainly not, the airline could have done more to make it more attractive. The number of sleeping passengers, you do the counting. This is the Scoot-In-Silence cabin; better legroom space and quiet. No babies were allowed in this section. Windowless seat at row 6 and 29 beware! I wanted to choose the seat at this row, perhaps next time. I had tried it and indeed it has better legroom space than the normal ones. Entering the cabin, I was greeted by mostly young Chinese cabin crew. Not all of them acknowledged my presence while making my way to my seat. Comparing with other Low Cost Carriers, this set of crew were not really enthusiastic about their job or friendly towards the passengers. I wasn't expecting much from the service side to be honest. The crew that I had on my previous flight experience were older and more experienced than this set, that's for sure. Ipad and smart phones may be allowed to be used during take-off and landing but I recommend you to pay attention to the safety video or demonstration before take off and during landing, its better to spend a few seconds to look outside of the window just in case. Since it was a red-eye flight, I didn't order the meal and had a good rest. Without the in-flight map, it feels weird but somehow I managed to get the time passed quickly and we landed smoothly at runway 07L. The eagerness of the other passengers getting off the plane was quite obvious so I let them go since I had plenty of time before my next flight. I was glad the flight went smoothly without delay. The Boeing 787 has definitely bounced back from its darkest moments of its career (battery issue) and its doing quite well at this moment. Long may that continue! Windowless seats: Row 6 and 41. If you notice other windowless rows, do let me know. My favourite mood lighting! Do you like it ? Many passengers took photos of the colourful lighting while heading to the exit. For the passengers, we got to alight and head to our respective destination but for the crew, they have to head back to Singapore. Well, at least they are on a Dreamliner, not on a narrow-body (A320 or B737)! What's on ScooTV? I didn't check it out. The airline's magazine which includes some interesting information about the Boeing 787-9 Dreamliner. Some interesting articles that caught my attention! I paid $10 for these 2 items. I used it on my return flight and a review on that plus the ScootBiz products on my part 2 of this trip report. Meanwhile, here are some photos of the webpage available when you are flying on a WiFi enabled aircraft. Even if you are not connected to the Wifi, you are still able to browse through some of the contents over here. The WiFi charges - you decide whether its worth it or not. For example: If you have tons of important emails to send out and you won't take long, the $$ may be worth it, more worth it than buying in megabytes. I cannot imagine paying money for the in-seat power (AC Adapter), its my first experience and I won't pay for it. You can upgrade your seat by paying on the spot, but for the ScootBiz passengers, they may be disappointed someone ends up sitting beside him. Good for the airline and paying passenger, bad for the ScootBiz passengers. Remember! All these pages don't require WiFi to access them. Alternatively, there are magazines at the seat pocket which you can read up. What's the difference between the Dreamliner's toilet and the older aircraft? This sensor, if you wave your hand near it, it will flush. This is the older way of opening the door which is easier to open. Comparing the interior between Scoot, Norwegian and Jetstar's 787, Scoot has probably the weakest product among the trio. There may be Wifi, but it's expensive and I don't think many were take up the offer (I may be wrong though), at least for me I don't think I will after trying it. I still prefer to have the IFE system at the back of the seat and even if I have to pay for it, I would gladly do so especially for day flights, its more difficult to sleep. For a new cabin like this, how can you not have USB port? Scoot could have done a lot more to improve the interior. As for the service, it is no where near the in-flight service of Korean and Japanese Low Cost Carriers, the service in those countries is much better. I was quite underwhelmed with the service, finding it pretty disappointing on the whole. I hope you enjoy this trip report. Just wanted to let you know how much I enjoy reading your blog! I love that you share which plane you take and the pictures that accompany your posts. I just booked a flight on eastarjet. Thanks for sharing! Hey Charles, passed by your blog while reading up on the reviews on Scoot 787 because I noticed that the seats are pretty narrow. 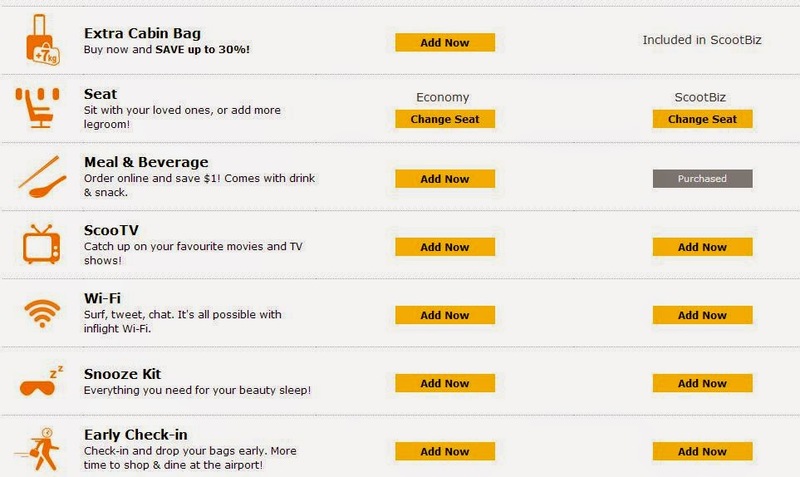 Did you notice that the price for the inflight Wifi has gone up by $1? In the past it was $23 for 3 hours but it's $24 now. The width of the Economy Class seats is standard not just on Scoot, the other Boeing 787 operators (Both Premium and Low Cost Carriers) as well. Didn't notice the price of the wifi, did you use it? If so, were you satisfied with the connection? Most valuable and fantastic blog I really appreciate your work which you have done about the When Airline overbooked,many thanks and keep it up.